I just came from the Barbie Designer Chat an hour ago and Robert Best has confirmed that there will be a silkstone Francie in store for us Francie lovers in 2011! He has also hinted that there will be more than one Francie and that she will remain true to her Mod beginnings...a completely new face sculpt for the silkstone line! How exciting is that?...Well, that's all. I just needed to let out my excitement! I'd been dreaming of a silkstone Francie since I first held a vintage Francie of my own. There are 8 shopping days left until Christmas! Are you all set for the holidays? I am dying. 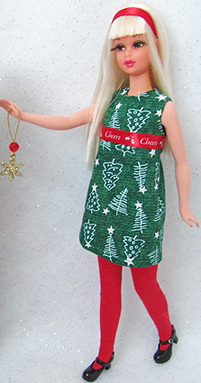 I hope it's a new body too since Francie's slimmer than Barbie. Yes Aubrey, her body would be different as Barbie is a bit fuller in certain areas than Francie. Robert has assured everyone how he's tried to remain true to the Francie we all know and love. Sounds interesting! It'll be great to see what comes out of this. I love Francie so seeing an incarnation as a silkie would be neat!